The Washington Library Association was formed in 1852 by 22 men. Books were circulated via auction. Frederick W. Gunn was elected President of the Association in 1855. By 1887 the Association became the Washington Reading Room and Circulating Library Association. The Reading Room opened to the public in 1891, and 11 years later E.H. Van Ingen pledged land and money toward building a permanent library. In a nearby house in 1899, the local DAR chapter opened the Judea Historical Room. In 1907 the DAR voted to bestow their collection to the Library to be housed in the basement of the new Library building. Gunn Memorial Library, designed by Ehrick Rossiter, was opened and dedicated in 1908. The 1781 house bequeathed by June S. Willis in 1965 allowed the Museum collections to be moved next door. The Junior Library opened in 1967 in the vacated basement of the Library through the efforts of Dorothy Richards. In 1990 it was decided to launch a Capital Campaign to address the Library’s overcrowding. $2.5 million was raised, greatly expanding the Library, renovating the Museum, and increasing the endowment. The 7,500 sq. ft. addition to the Library and the Museum renovation were completed in 1994. Just four years later the Library became fully automated with the addition of networked computers, membership in Bibliomation, and an online collection catalog. 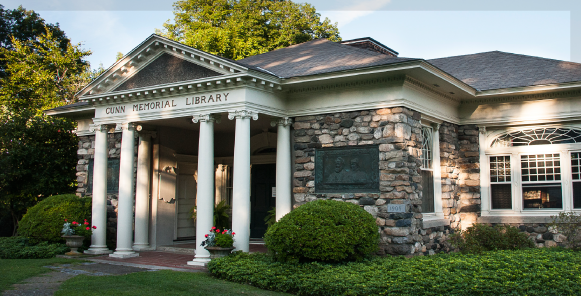 The Library was awarded the Excellence in Public Library Service Award by the Connecticut Library Association and the Connecticut State Library in 2001 for the category of public libraries serving towns with a population of less than 25,000.